Almost all discussions and speculations on the Safe Haven’s telegram group are now centered on the to-be-announced Master node details. According to the Q1, Q2 roadmap which was released towards the close of 2018, master node details remains the most requested and anticipated for. There are no mistakes on why the community is eager to know details of Safe Haven’s master node. Safe Haven’s master node holders will be able to get rewards according to the numbers of tokens they locked from time-to-time as the platform’s exciting solutions are used. Members want to know how many SHA tokens they are supposed to hold but the team is only willing to release this details according to the roadmap. The Safe Haven community is waiting for this announcement to be made by the end of the month of January. Ordinarily, they are supposed to be expecting the master node details between January and March (Q1) as specified by the Roadmap. But according to the Easter egg found by the community members in a YouTube video where the Co-Founder, Dujardin Logino, was interviewed, it is ascertained that the long-awaited announcement will be by the end of the month. In a picture teaser sent by the co-founder, Logino, on the telegram group earlier today, the names of the master node levels are revealed. This sent another wave of excitement through the hearts of the community members. The picture did not give any more details aside from the names of the master node levels- It was carefully cropped. ‘There is no doubt that the expected announcement will positively affect the price of SHA despite the nose dive the crypto market has taken’ as speculated by a crypto enthusiast. ‘You should have seen the excitement after the Q1, Q2 Roadmap was released late last year by the team. It literally raised the price to an all-time peak of $0.00258 (0.58VET) from almost $0.0005 when it was first listed at Latoken’, He stated. ‘I believe there no limit to the height the price and adoption of SHA can reach as the team members are diligent to follow the roadmap’ He concluded. 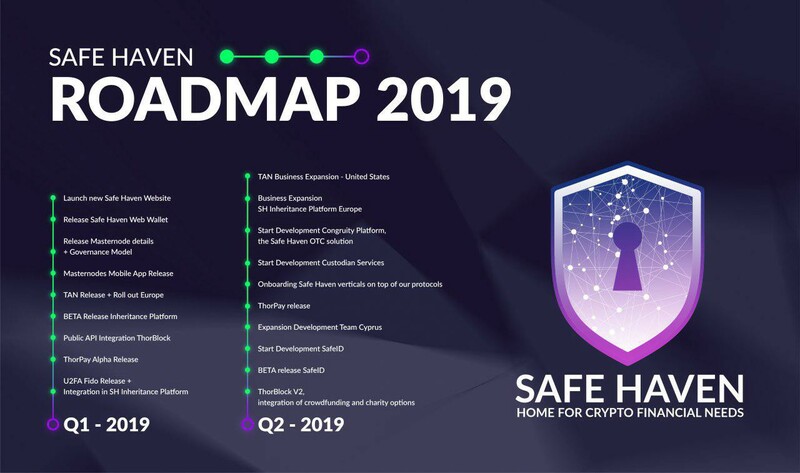 Safe Haven is a Crypto Asset Management Technology Infrastructure Builder which helps all businesses and users. Safe Haven is also an inheritance platform which can give users the ability to transfer their crypto legacy (assets) securely to their heirs. Through the platform, users can encrypt their crypto wallet’s private key and turn them into shares which can be distributed to family members for safe keeping. These shares can be brought together at the demise of the owner to form the whole private keys again thus restoring the access to the wallets. This cannot be possible at the when the owner’s private key is active. There are other solutions from Safe Haven like the Thorpay, the Trust Alliance Network (TAN), etc. The Thorpay allows anyone or business to be able to send assets or tokens on Vechain to multiple accounts with just one click. This will help ICOs which are running on Vechain to distribute their tokens effortlessly. The alpha version has been released a few days ago. The Trust Alliance Network is the social hub for all blockchain legal affairs. Users will be able to use TAN to connect to a legal entity for advice or consultation which are based on blockchain and cryptocurrency. Ultimately, anybody who wishes to use any of Safe Haven’s solution has to lock some number of SHA away. Thorpay will use SHA as gas. As explained by Logino in the video above, some percentage of the SHA tokens used as gas will be burnt and others will be used to reward masternode holders. Read more about Safe Haven here. Get the latest news and updated news about your favorite blockchain projects through The Currency Analytics and FinancialReport24. Invest in the google approved news website through TCAT for Real and Authentic News is our motto.